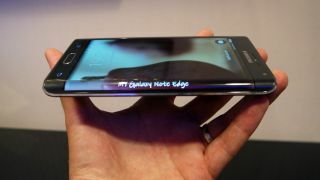 Samsung has confirmed that its unique smartphone, the Galaxy Note Edge, is indeed coming to the UK, and will be available to buy from selected retailers from Friday November 28. If you want to make sure you can get your hands on Samsung's latest phone, along with its bendable OLED screen that wraps around one edge, you can pre-order it from the Samsung online store and Carphone Warehouse from Friday November 14. Samsung originally billed the Galaxy Note Edge as a limited edition concept device, leading us to fear that it wouldn't show up on these shores, so we're happy to hear those of us in the UK will be getting our hands on the device after all.